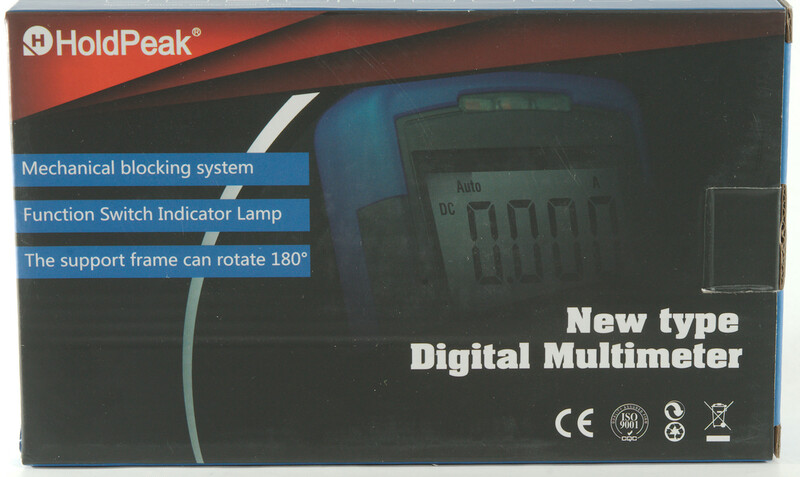 This is a DMM with 40000 count display and lot of functions. It arrived in a universal HoldPeak cardboard box. Inside the box was a pouch with everything inside. 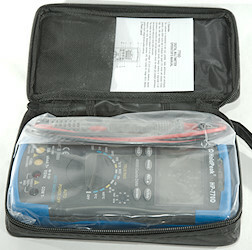 It included the DMM, a pair of probes, a thermocoupler, a instructions sheet and the pouch. This means the rating is wrong. The plug is fully shrouded. The thermocoupler is encapsulated, this makes it usefull for inserting in stuff, but not as good for measuring surface temperatures. Using the tilting bale I was a bit worried about it breaking, after some time it got a bit more loose. There is a small light in the range switch. The sleeve do not give much protection agains bumps. 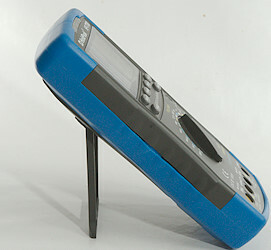 Display during normal usage, it will show selected range and value. 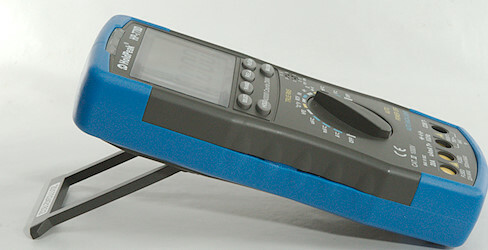 Voltage detector shows dashes depending on the strength of the electric field. It will also beep and turn on a red led while there is a field present. 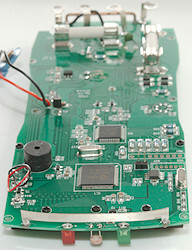 At the top is two leds used for the NCV, green when no field detected and red when a field is detected. 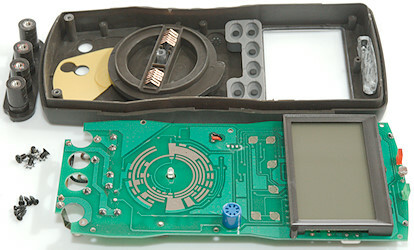 The center position is a photosensor used to turn on the backligh on the display and the light in the range switch. 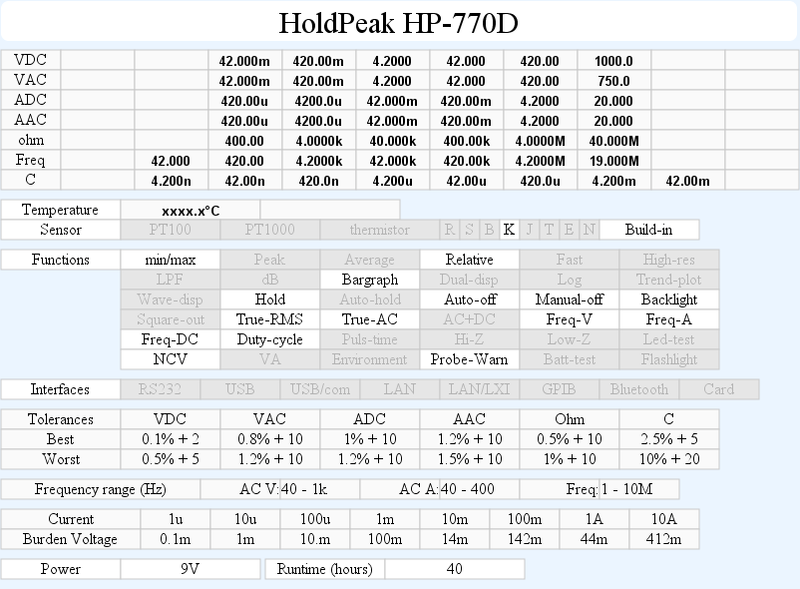 Select: Select between AC/DC and different function for ohm settings. Range: Will disable auto range and change range, hold down to activate auto range. 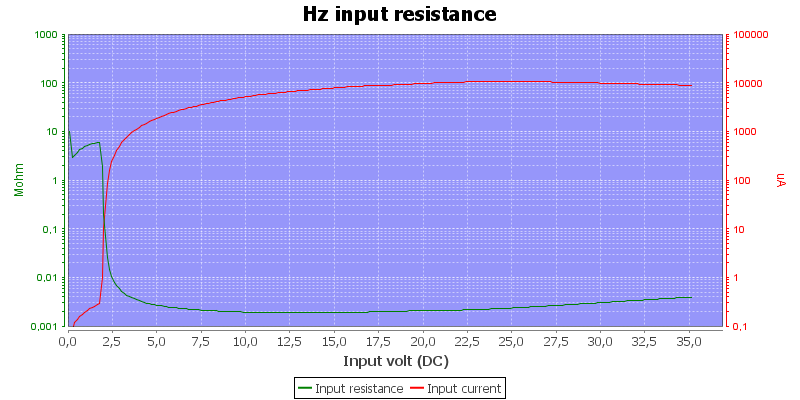 Hz duty: Shows frequency and duty cycle in AC and frequency ranges. Max/Min: Captures maximum/minimum values, will show min/max, requires repeating pulses to capacture the full value. A: Current AC and DC. In AC the Hz button will show frequency and duty cycle. mA: Current AC and DC. In AC the Hz button will show frequency and duty cycle. uA: Current AC and DC. 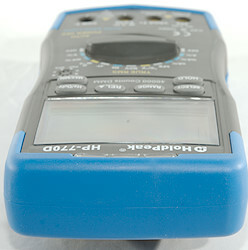 In AC the Hz button will show frequency and duty cycle. 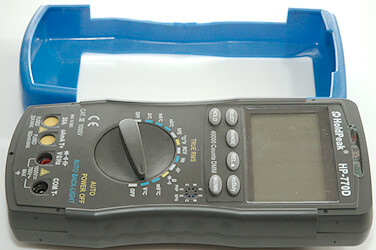 °C/°F: Temperature, will show internal temperature when no probe is connected. 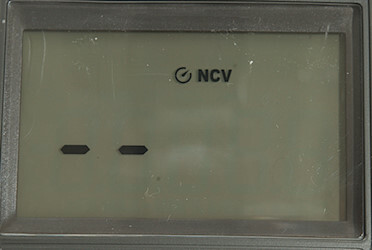 NCV: Non contact voltage or electric field detection. Hz: Frequency, use Hz button to select duty cycle. 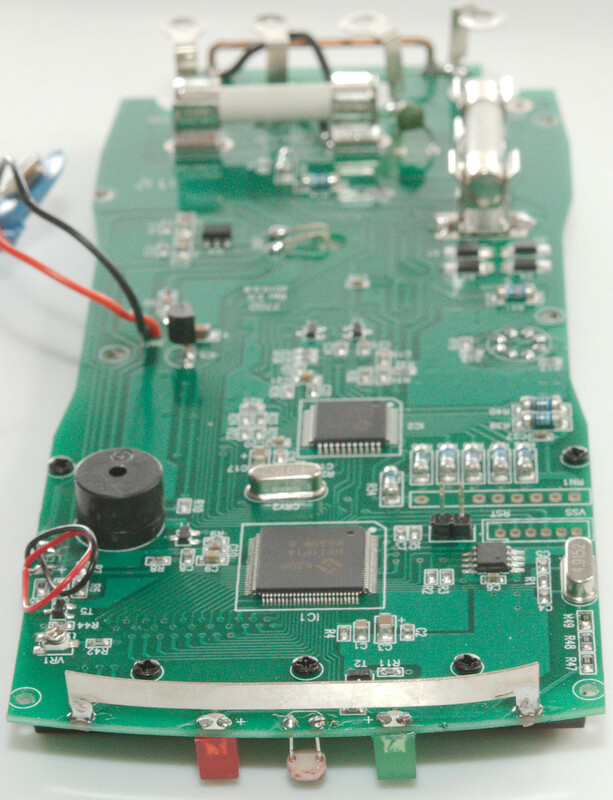 : Resistance, diode and continuity. mV: Show DC or AC mV. In AC the Hz button will show duty cycle. 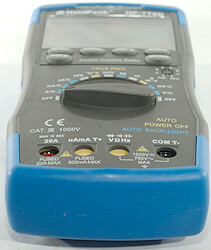 V: Show DC or AC Volt. In AC the Hz button will show duty cycle. REL and MAX/MIN turns off auto ranging. 20A: High current, maximum is 20A for 10 seconds. mAuA: The lower current ranges and temperature. 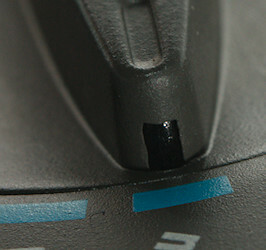 The shutters secures that only the correct inputs are accessible. 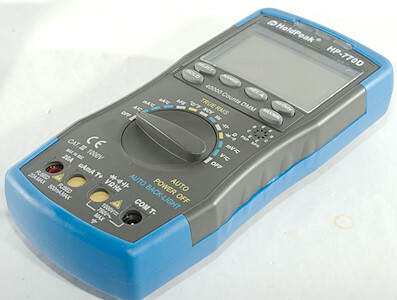 Frequency counter (Range Hz) will count as long as the voltage goes within 1V of COM positive or negative. 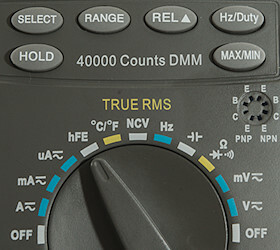 Frequency counter and duty cycle can only be selected in AC ranges. 1 VAC is 5% down at 5.0kHz (RMS will not work at the frequency). Min/max is about 360ms to capture a value (It require that the peak repeats). Frequency input is 3-6Mohm below 2V above it drops to 2kohm. 20A for up to 10 seconds. Continuity is moderate (About 110ms). 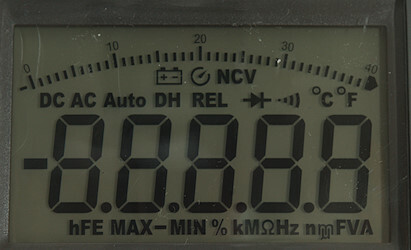 Continuity beeps when resistance is below 62ohm. 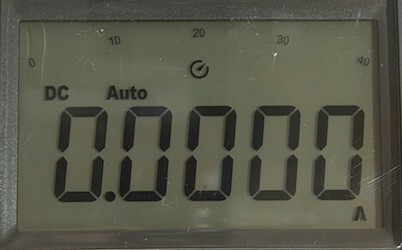 11000uF takes about 9 seconds to measure (A too low value is shown af 5 seconds). 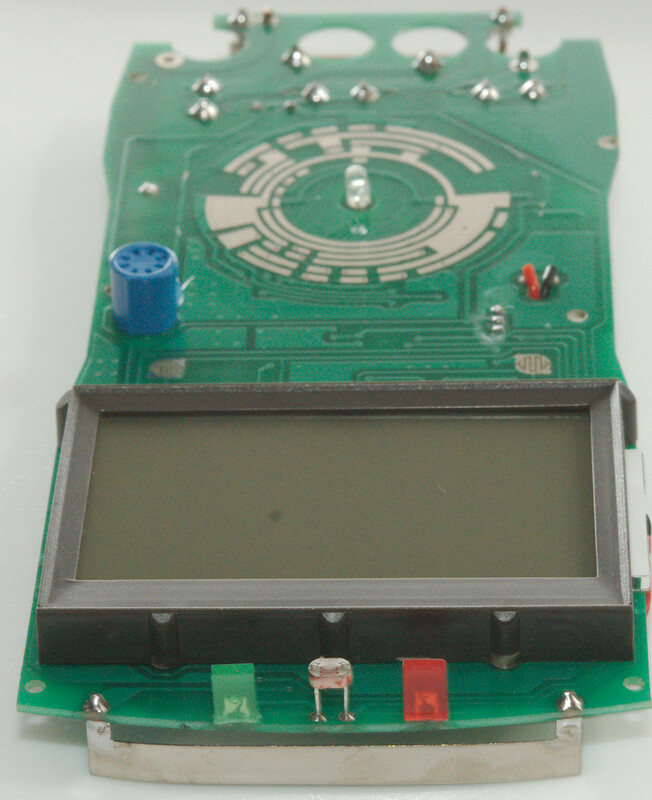 Meter works down to 2.4V where it will turn off, battery symbol show at 8.0V. Backlight has a significat hotspot where the led is placed. Bargraph works at same speed as the numeric readings. The meter usual need a couple or more display update to reach the final value. 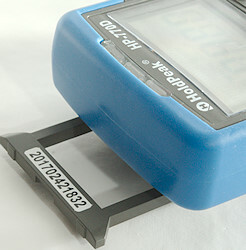 Backlight is controlled by ambient ligthning, i.e. it turns automatic on. Will automatic turn power off in about 15 minutes (Holding SELECT down during power on to disable). 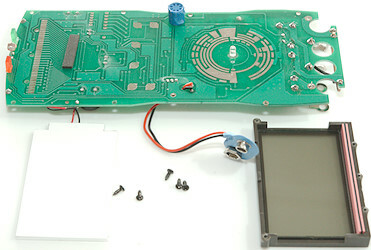 Standard probes can be fully inserted. 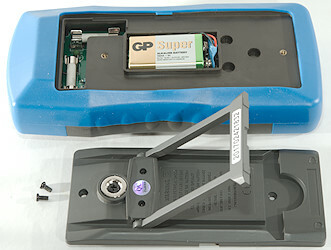 Weight is 355g without accessories, but with rubber sleve and batteries. Size is 194 x 88 x 44mm with rubber sleve and battery. Probe resistanse 42mOhm for one. 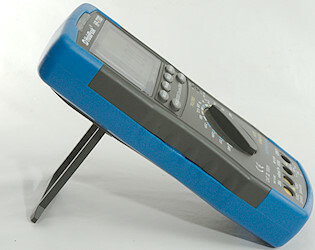 A look at the capacitance measurement waveform when measuring 1uF. Manual list 9999 is maximum in capacitance and frequency, that is not correct. I had to remove two screws to open the DMM. 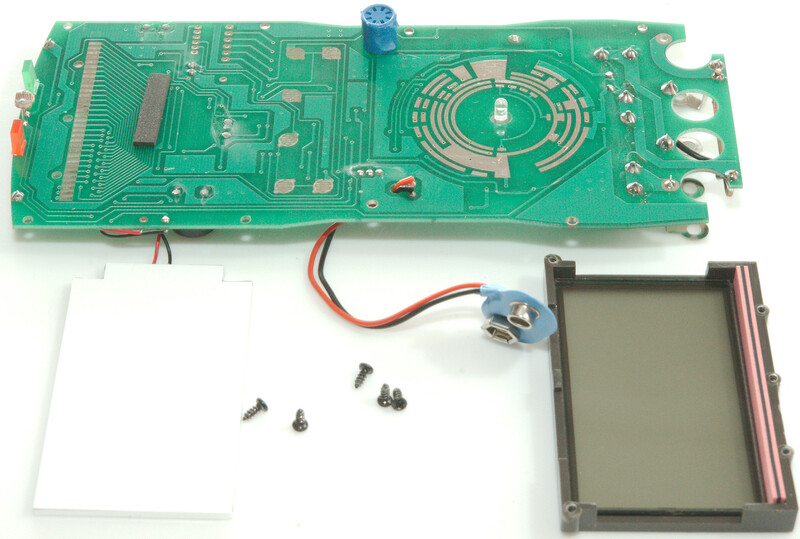 The circuit board is shaped to fix exactly. 6 screws and I could remove the circuit board. I did also remove the screws for the input terminals, but that was not necessary. 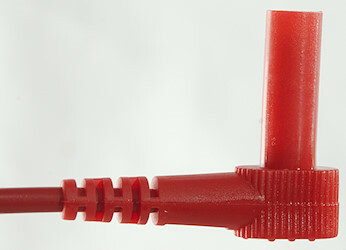 There is a light pipe at the center of the range switch. The range switch has a track to control the shutters. The click uses small steel balls, they had a tendency to pop out when removing the circuit board! On this side of the circuit board is the transistor tester socket, the display, the two leds and a LDR (Light sensitive resistor) in addition to the pads for the switches. I had to remove 5 screws to get the display free. And there is nothing under the display, except from some soft stuff to prevent the backlight from rattling. The 20A shunt has a oops wire to the fuse, the track was obvious not enough. The uA and mA shunts are the two MELF resistors (R14: 99ohm, R15: 0.99ohm). The diodes (D1, D2, D3, D4) is protection of the current shunts. 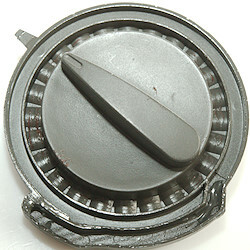 There is a led in the center of the range switch. For protection of ohm and other ranges there is a small PTC and two clamp transistors (T3 & T4). 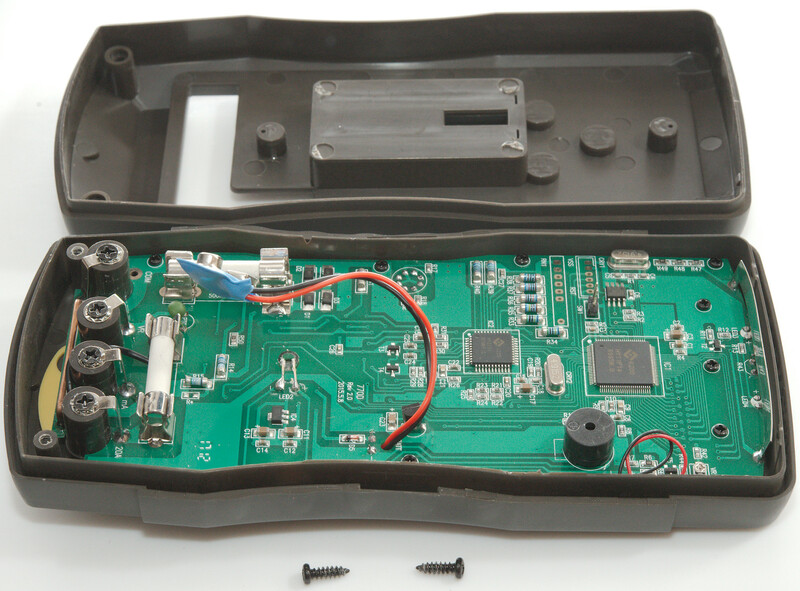 It looks like a diode (D5) protects the meter agains wrongly connected battery. There is a 3.0V supply (IC4: 7530) and a reference (IC5: LM385-1.2). The meter frontend (IC2: HY3131 50000 count DMM chip) with a processor (IC1: HY11P14) and a parameter memory (24C02N). 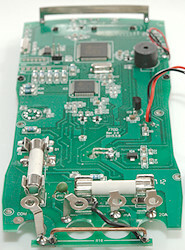 The NCV antenna is a metal strip soldered in the circuit board. 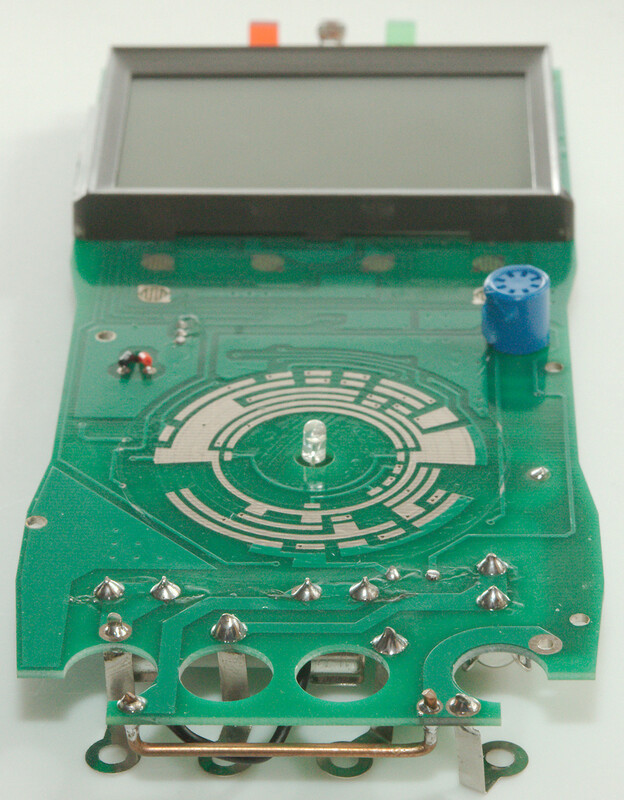 It uses two high impedance resistors (R47 & R48: 2x100M, R49 is only 10Mohm) to control the potential on it. 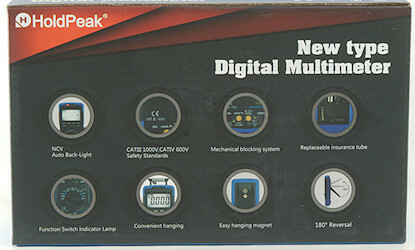 As usual on cheap(er) DMM's the CAT rating is wrong, meter cannot be rated for 1000V and use 500V fuses. The transistor tester may also be problematic. I like the high resolution, but it only increase precision on VDC, all other ranges do not have higher precision, only higher resolution. The shutters reduces the risk of mistakes when switching between voltage and current, it is a good safety feature. The non standard sequence of input terminals are not. The meter has a very good selection of ranges, but some more advanced functions is missing (Like average and peak). Display updates are fast, but that do not make the meter fast, it is rather slow.